As the Church celebrates the Solemnity of the Glorious Assumption of our Blessed Mother into Heaven, I invite you to meditate on these wonderful words of hers. I have no doubt they will bring you reassurance, hope and peace. “Look today at your heavenly Mother, assumed to the glory of paradise, even with her body. Unite yourselves to the joy of all the angelic cohorts, of the saints, and of the souls who are still being purified in purgatory. Share also in the joy of the Church, pilgrim in the desert of the world and of history, which contemplates your heavenly Mother as a sign of consolation and sure hope. — I am a sign of sure hope for the Church, as she walks toward her perfect glorification, which she will know at the moment when Jesus Christ returns to you in glory. And thus, I am preparing for it new days of peace and not affliction, of serenity and joy. Above all, in these last times, I am making myself present in a powerful way to prepare humanity to receive Jesus who is about to return in glory to bring about its total and perfect transformation. — I am a sign of sure hope for you sinners and you who are far away, for you the sick and discouraged, for you the oppressed and persecuted, for you the stricken and crushed, for you who are smitten by violence and hatred, for you who trampled underfoot and slaughtered by fratricidal struggles and wars. 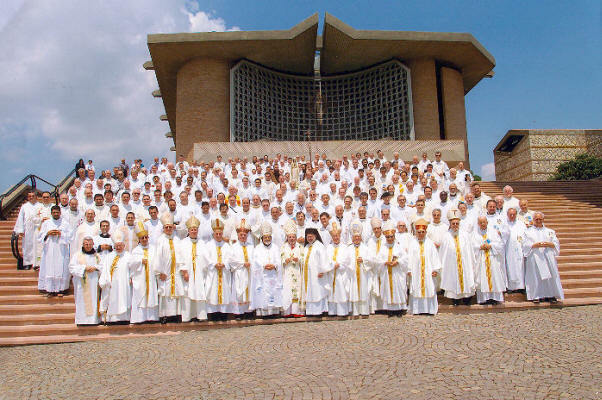 This year, my improved health permitted me to attend the annual Spiritual Exercises (retreat) which took place from June 26 to July 2, 2005 at the renowned Shrine of the Merciful Love located in the mountains of Perugia, close to Assisi. The Shrine was founded by Mother Esperanza, a great mystic, who died in the odor of sanctity on February 8, 1983. On the grounds of the shrine is a spring of miraculous water. Many cures have already been obtained through the intercession of the foundress and the use of this miraculous water. Despite his advancing years and medical problems, I found Fr. Gobbi to be “back to his old self.” With much enthusiasm, he delivered four very inspiring talks. Unfortunately, we are unable to offer them at this time since they have been not been translated. Other speakers were Fr. Michael Gaughran, S.S.C., National Director for Great Britain; and Fr. Ivan Pojavnik, a professor of Patristics at the University of Ljubljana in Slovenia. I am making available one of Fr. Michael’s conferences, The Eucharist and Our Mother …very appropriate for this, the Year of the Eucharist. Some time in the near future, we hope to be able to provide you with the two talks given by Fr. Ivan Pojavnik. We extend our sincere gratitude to these very gifted speakers who have allowed Our Lady to use their talents to give us spiritual nourishment. Many ask if Fr. Gobbi continues to receive messages from Our Lady. If he does, they are private ones. I have no doubt that she continues to guide him as he leads her army of priests. As Our Lady said in her last message of December 31, 1997, through Fr. Gobbi she has already publicly revealed to us everything we need to know to prepare ourselves for the great tribulations and the return of Jesus. This year’s Spiritual Exercises were attended by 275 members representing forty-two countries throughout the world. Among these were one cardinal and sixteen archbishops and bishops from ten different countries: Lebanon (2), Italy (1), Vatican City (2), Mexico (1), Argentina (2), Brazil (6), Dominican Republic (1), Ireland (1), Uruguay (1), and Peru (1). From the Vatican were Cardinal Ignace Daoud, Prefect of the Congregation for the Oriental Churches (one of the five Cardinals who have granted their Imprimatur to the blue book), and Monsignor Giovanni D’Ercole from the Vatican’s Secretariat of State. Msgr. D’Ercole gave a talk at one of the evening’s fraternity sessions. He shared with us that Pope Benedict XVI has great admiration for the Marian Movement of Priests and holds it very dear to his heart. All in attendance were elated to hear this, and the entire assembly broke out in very loud applause. After the retreat, the American and Canadian delegations spent a few days in Rome to see and hear the Pope. It is said that Benedict XVI draws even greater crowds than Pope John Paul II did during his early days as Pope. At the Angelus of Sunday noon, St. Peter’s Square was filled with people of all ages, but the vast majority were the youth. The Wednesday Audience was held outside and again a very large crowd had gathered. We were blessed to have reserved seats in the front and to the left of the Pope. Since he has reduced the number of private audiences, we were not able to meet with him privately. Pope Benedict XVI spoke very softly, yet very clearly. His Italian is simple and easy to understand. He is very determined to rectify many wrongs in the Church, and has already made some changes as to the manner in which the Papal Mass is to be celebrated. He has expressed some of his plans to correct some abuses in the Church and in the celebration of the Mass. I truly believe that he is another great gift to the Church. At the retreat, Fr. Gobbi expressed his great joy in having the former Cardinal Ratzinger as our new Pope. Fr. Gobbi has great confidence in him. I am sure that Our Blessed Mother wants all of us to follow him as she wanted us to love and follow John Paul II. We must continue to pray for our new Pope. His reign will not be an easy one, and he needs our love and spiritual support. Attacks on Our Lady’s Movement are on the increase. I believe that many of these persons speak ill of the MMP out of sheer ignorance. Either they have never read the messages, or if they did, they were not attuned to Our Blessed Mother’s teachings. I have had several cardinals and bishops from other countries, and here in the U.S., ask me for books to hand out to their priests. They recognized the great value of these messages. I believe that any bishop who would take the time to read this book would want to give a copy to all of his priests. Too often, decisions against the Movement and its book of messages are based on hearsay. To them, I would like to quote the Scriptures: “Taste and see how good the Lord is.” Our Lady’s messages are the words of the Gospel taught to us by the very Mother of Jesus. She taught Him, she listened to Him speak and she lived with the very Word made flesh. What better teacher can we have? Is there any theologian or Scripture scholar, as notable as he or she may be, who can begin to compare with the Mother of God? We often hear from priests and laypersons who say that, since the Vatican has not yet officially approved of these messages, they will not read them. Yet how many other “unapproved” spiritual books do these same persons read without giving it a second thought…we must learn how to discern what is good. Keep in mind that it takes years for the Church to render an official declaration as to the authenticity of such phenomenon. The apparitions of Fatima were declared worthy of belief only after a long canonical investigation. Are we to expect less for the M.M.P.? As I have previously stated, many cardinals and bishops have accepted these messages as coming from Our Lady. Of course, the enemy will always be lurking in trying to destroy the work of Heaven. This Movement has enough competent and reliable supporters within the Church that we can safely believe in the authenticity of Our Lady’s messages. In only a few years, the MMP has spread throughout the entire world. It has changed the lives of thousands of bishops, priests and lay people. How, then, can some attribute this work to the Evil One?…preposterous! Still others say it is merely the work of one simple priest who has been traveling the globe and calling people to consecrate themselves to the Immaculate Heart of Mary and to pray the holy rosary. Undoubtedly, this amazing transformation of so many people in so short a time has to be the work of God Himself through Our Lady. Do not, therefore, let these false rumors and claims upset you…they come from the other side. Keep your eyes on Mary and continue living your consecration each day. Our Blessed Mother said in her messages that she herself would remove any obstacles that stand in the way of her Movement. Trust her and be not afraid. The final victory is hers. Please do not abandon your cenacles…they are needed now more than every before. Multiply them, and form new ones. Our Pope, Benedict XVI, and all bishops and priests need our loving and spiritual support. One need only listen to the news to realize how necessary these cenacles are for the welfare and protection of the Church and its people. These cenacles are the lightning rod that protects us from the attacks of the Evil One and his minions. It is also there, in these cenacles, that our own spiritual transformation is taking place. You will soon understand that, by means of them, Our Lady is preparing us to receive Jesus when He returns in his glory. He will come again to transform all of creation into new heavens and a new earth where there will be no more sin, no more suffering and no more death. It will be paradise on earth all over again. Jesus will submit all creation to Himself and present it to the Father has his gift of love for Him. Prepare yourselves, because the victory is close at hand. May the Lord bless you and all your loved ones, and may Our Lady take you by the hand and guide you to her Son Jesus.